It's the last day for this month's Lawn Fawn inspiration week. I hope you've enjoyed it! 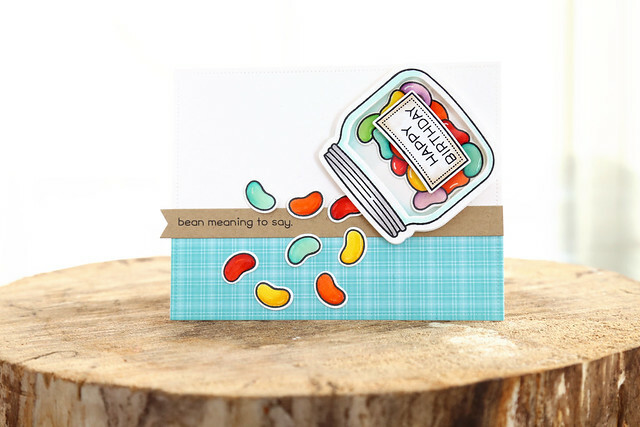 Today we're showing off the new How You Bean? stamp set and add-on shaker dies. 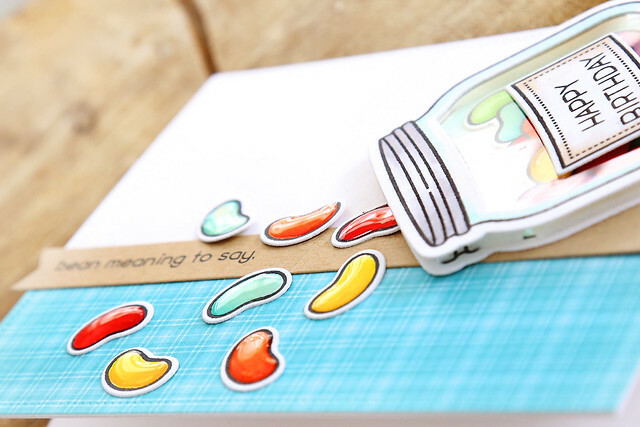 I turned things upside down to create a jar of birthday jelly beans, spilling out for extra fun. I took the time to add gloss to each jelly bean. Totally worth it. They look yummy! 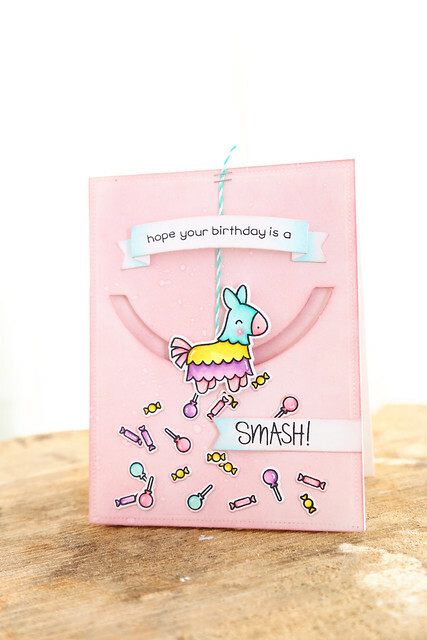 Kelly Marie used my card as inspiration for one of the cards in her video this morning - click! 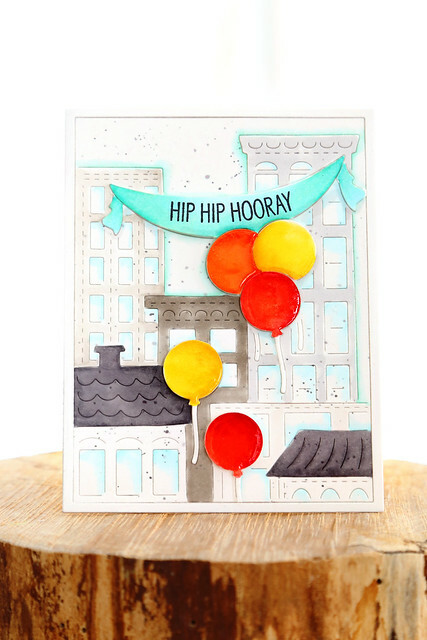 I made a card with the new City Celebrations cover-plate die. I love that it covers the entire card-front! I cut out the city-scape 2x, so that I could color and layer the balloons and banner over the base layer. I colored the buildings in different shades of grey, and gave the windows and building outlines a soft blue wash. I wanted the pop to come from those glossy balloons! I colored them and coated them with glossy accents before glueing them onto the card. 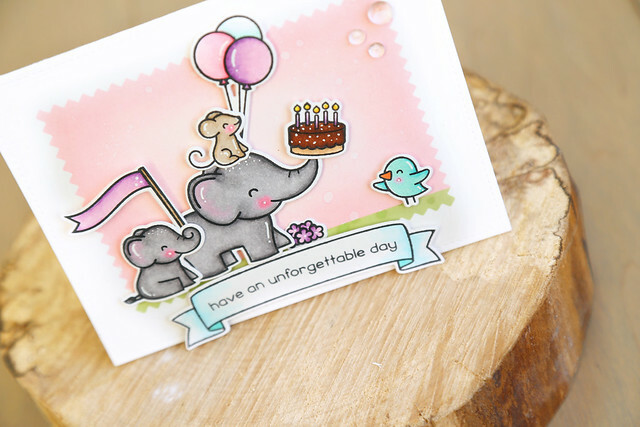 The sentiment is from the coordinating stamp set, also called City Celebrations. 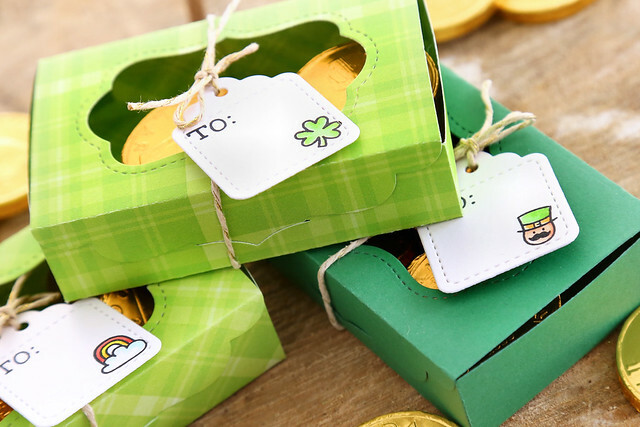 The team is showing off the new Fancy Box die, and I made a trio of St-Patrick's Day boxes for my kiddos. 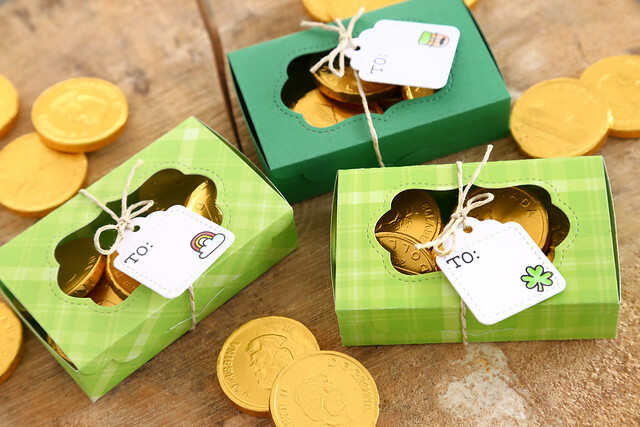 I cut the boxes out of green papers (I thought it would be fun to mix patterned and solid papers) and then cut into the tops with the label die so that you could see the gold coin chocolates. I love that the coins are totally Canadian, haha. I decorated each box with some gold twine and a Tiny Tag. The tiny tags are stamped with images from Plan On It: Calendar and Plan On It: Holidays. I didn't even know we had that little leprechaun guy! I hope you like my little fancy boxes. I had so much fun making them that you'll see more St-Patty's day decorations in a few weeks for my monthly Lawn Fawn party post! In the meantime, there's more to see on the LF blog this morning - click! 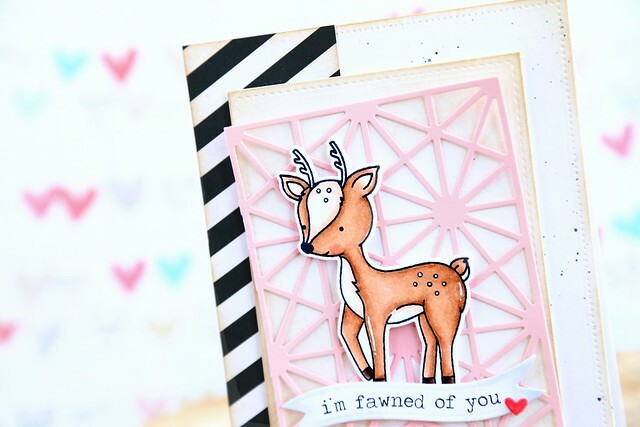 Welcome back to another day of Lawn Fawn's February inspiration week! 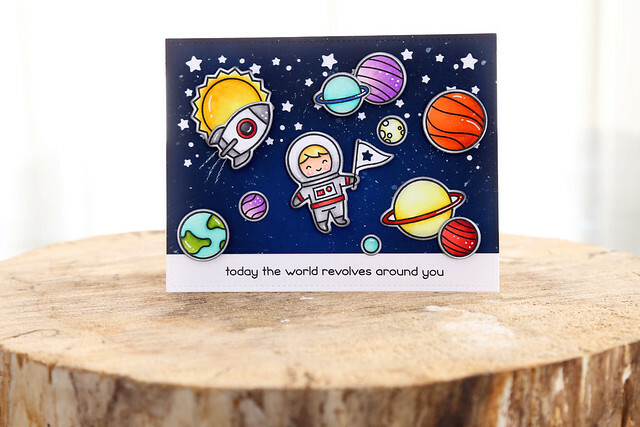 We're showing off the new Slide on Over Circles dies, perfect for making fun interactive cards. I used a partial die-cut technique to cut out a half circle for the Year Seven pinata to swing from. I gave the whole front panel a wash in Spun Sugar distress ink, and flicked water over the top to get those gorgeous freckles. The pinata, and all of the candy, were colored in soft yellow, purple, pink and mint. I made this for a little 6 year old in Maia's class, and I heard it was a hit. 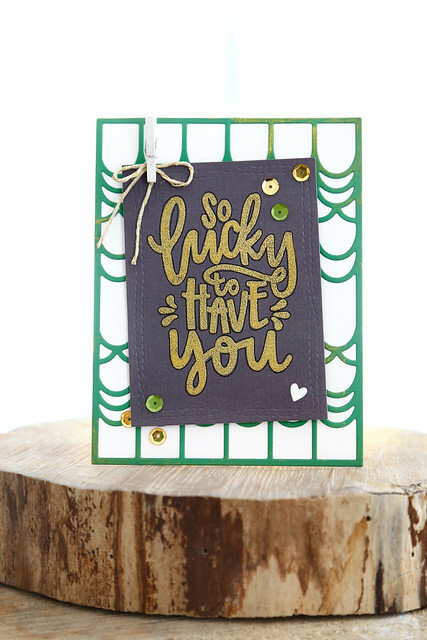 Welcome back to another day of Lawn Fawn's February inspiration week! 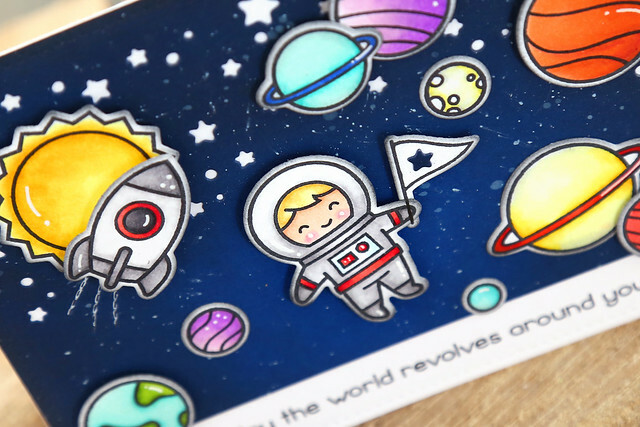 We're showing off Out of This World, the cutest little astronaut set! For my card, I started out with a piece of navy blue cardstock (Lawn Fawn's Blue Jay cardstock) and layered dark blue and black inks over it to create a deep, dark sky. Starting with a colored cardstock is so much quicker than layering colors onto a white paper. I flicked some white paint on top, and die-cut a slew of stars (using the Starry Skies die) to complete the background look. Then, it was just a matter of coloring and layering all of the images - my favorite part! As I was putting the pieces onto the dark background, I thought the white border around the images was too stark. In the close-up picture, you can see that I sponged a touch of black ink around the edges. 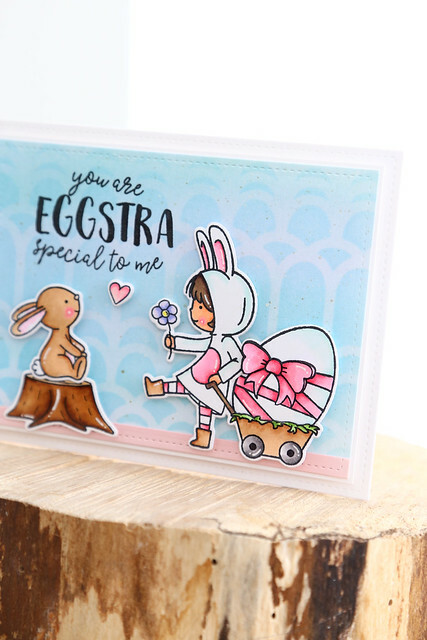 If you'd like to see more of this card, hop over to the LF blog this morning - Kelly Marie re-created this card in her video! Welcome back to another day of February's Lawn Fawn inspiration week. 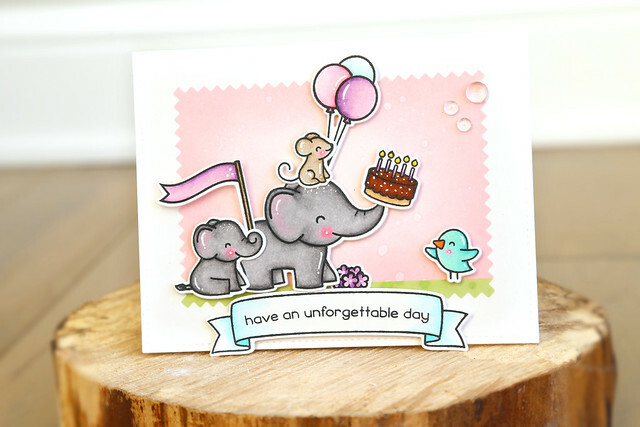 Today, we're showing off the new layering die set, Happy Hatchling. 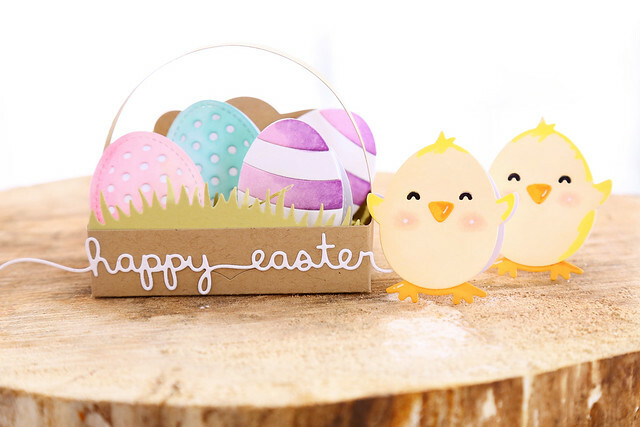 I used the chick and eggs dies to make a set of mini cards. I love teeny tiny cards! You could also punch a hole at the tops and call them folding tags. 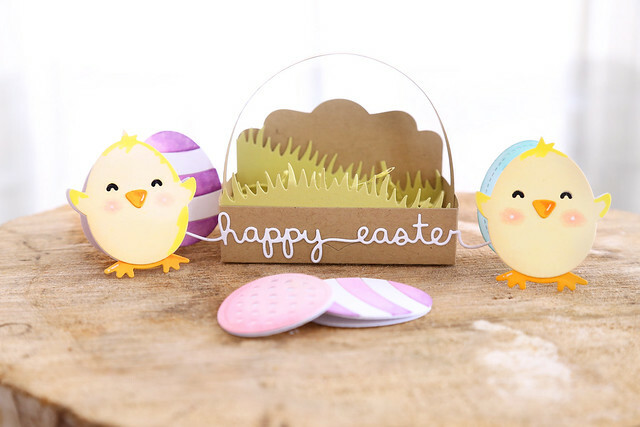 I used the new Fancy Box die to create a little Easter basket. I adjusted the die by shortening that back end and leaving it standing up. Nothing fussy here! Then, I added some die-cut grass and a handle. I will be completely honest. 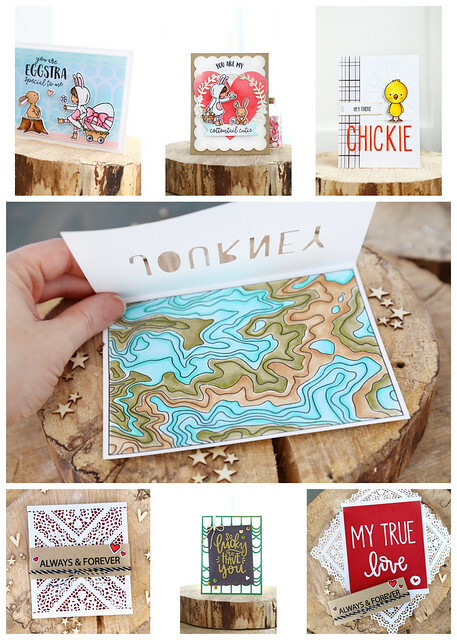 The part I love about card-making is stamping and coloring the images. Putting the cards together is, most of the time, an afterthought. And thinking of spending more time on fancy shaker cards? things that spin? light up? ugh. haha. I do love the end result, but I always find the extra effort to be too fiddly for my liking. BUT. 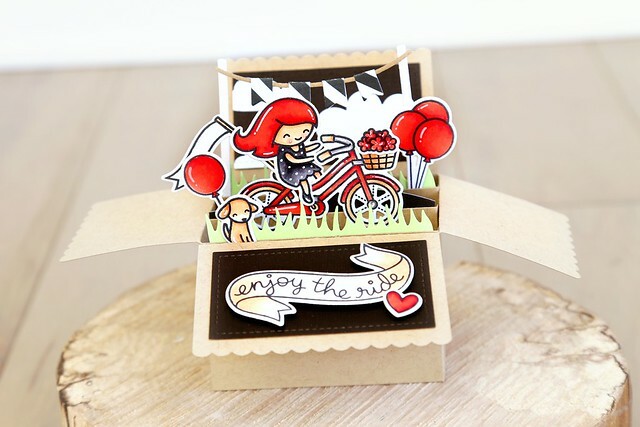 This new Scalloped Box Card Pop-up die turned out to be my favorite. It folds up flat, and then you pull it out of the envelope and it unfolds into a wonderful present, all on its own. I really enjoyed putting it together, and the whole family was loving the concept! I already gifted this card to a special friend over the weekend, I was so excited to create something unique for her! I know the girl's hair is kind of crazy red, but I really wanted to create something that stuck to a very tight color scheme: red, kraft and black. I love how it looks all put together! The images are from Bicycle Built for You, which will be releasing by the end of the month as well. I hope you like it! 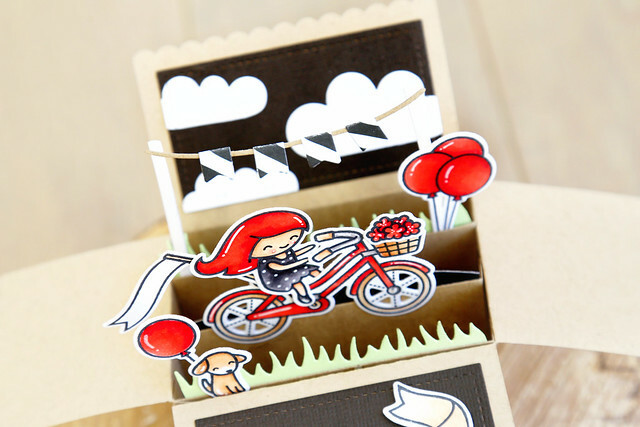 There are more versions of the Scalloped Box Card Pop-up on the Lawn Fawn blog this morning - click! It's Lawn Fawn inspiration week, with all new products finally for sale as of February 23rd! Today, we're showing off Elphie Selfie, featuring the cutest elephants ever. To create this card, I die-cut a Zig Zag Rectangle, and used the negative portion as a mask. I used distress inks to sponge a pink background for my scene, and just a bit of green grass. Since I created the background using distress inks, I flicked some water onto the background to give that dreamy bokeh effect. The rest of the images were colored and adhered to the card base using foam adhesives. I love that all of the critters are here for that little bird! It's been a fun week! As of right now, all of the new Neat and Tangled products are available in the store - click! Happy shopping, and I hope you've enjoyed all of the projects this week! Welcome back to another day of Neat and Tangled's February release week. We're showing off this amazing Doily Envelope Die, designed by Miriam Prantner and available exclusively in the NT shop. You won't be able to purchase it anywhere else. I cut 4 of the smaller dies and fit them around a red cardstock rectangle. It took some fiddling to see what size worked but it wasn't difficult. I adhered the 4 flaps, and then backed the whole thing with a matching rectangled of white cardstock. I love the red peeking through! It's so beautiful! 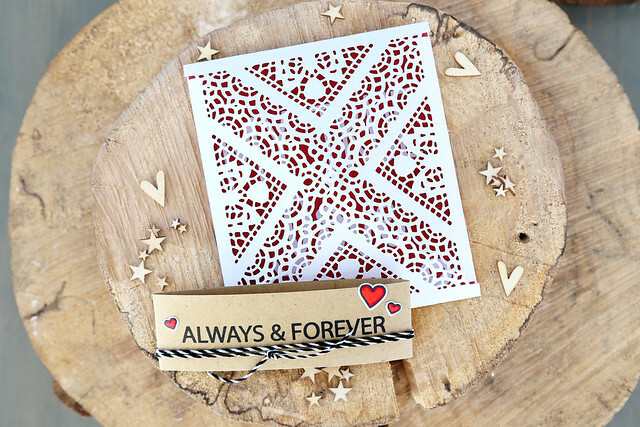 I created a sleeve for the card and stamped a greeting from Love Notes. I kept it so simple because I wanted only red and white peeking through the lace. I used the Journaling Alphas again for the first half of the sentiment, and the love die from Love Notes. 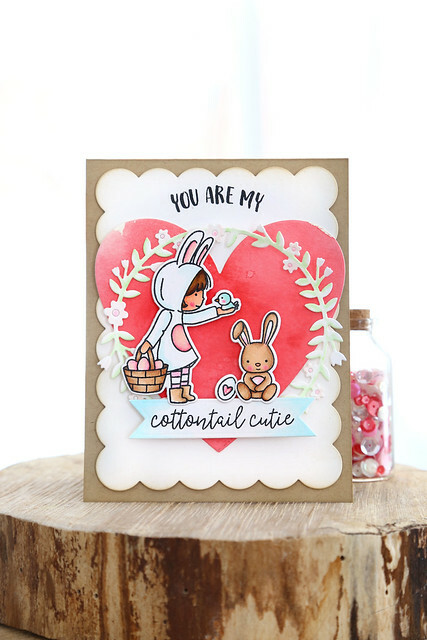 I have 2 cards to show off today, both using my new set for Neat and Tangled, called Cottontail Cuties. 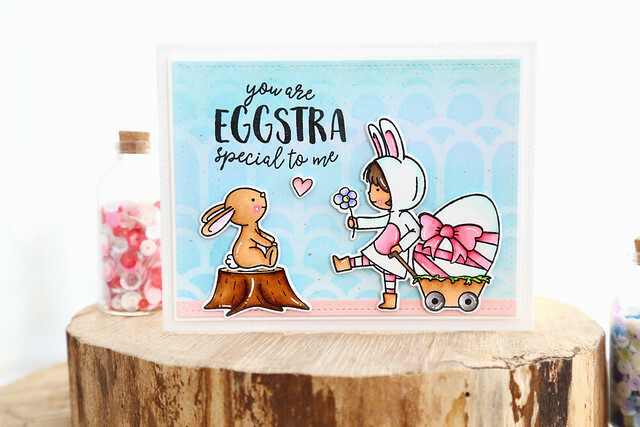 It features 2 girls dressed in bunny costumes, one holding a little chick and the other pulling a wagon full of Easter eggs. And obviously, a couple of bunnies. I love this one, with his arms folded together! For this card, I watercolored a huge heart, and put it against a scalloped rectangle. I then snipped off the "hooray" from inside the wreath and used that to frame my images. 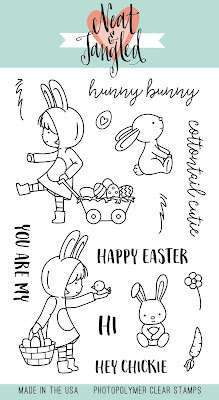 My next card shows off the second bunny and girl images. I cut away the little eggs from her wagon and put the huge egg from the new Eggstra Special there instead. 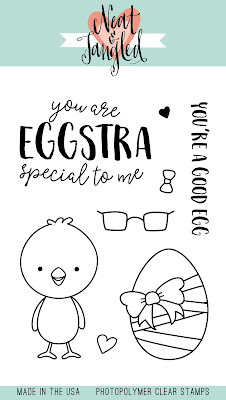 The sentiment is also from Eggstra Special. I propped up the bunny using the tree stump from Lumberjack Love, and did a subtle stenciling on the background layer using the new Scalloped stencil. A little tip: to make the girl look like she's really holding that flower, I adhered the flower behind her hand, and then used a black pen to draw a connecting line. 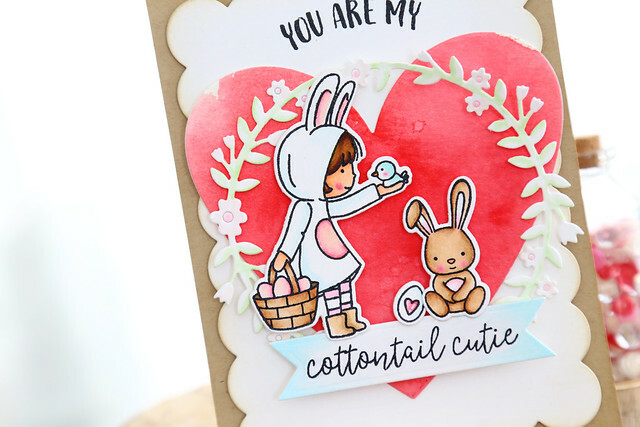 I hope you like Cottontail Cuties! There's more to see on the NT blog today - click! 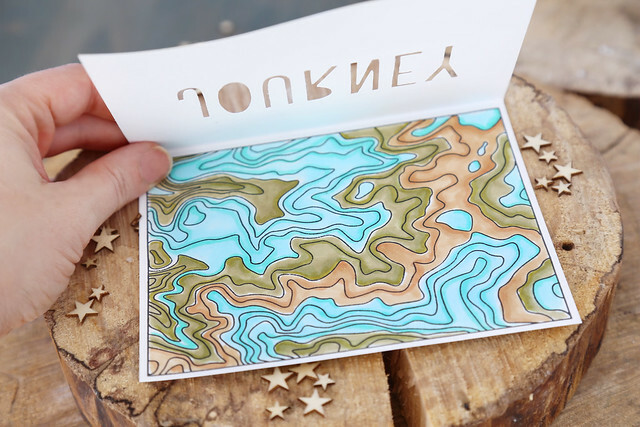 It's day 2 of this month's Neat and Tangled release week and we're all showing off Topography, illustrated by Miriam Prantner. 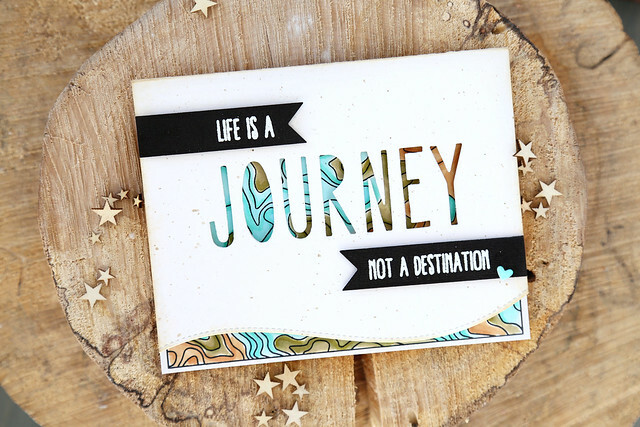 It features a great background, large enough to cover the front of a card, and a slew of travel-themed sentiments. I opted to die-cut the word J-O-U-R-N-E-Y using the same alphas as I used on yesterday's card. Pretty sure I like 'em. You could already see a sneak of the topography map, through the letters. When you open it up, you get the full view. It was fun to loosely color everything in with copics! If copics aren't your thing, this map would look fantastic in watercolor. 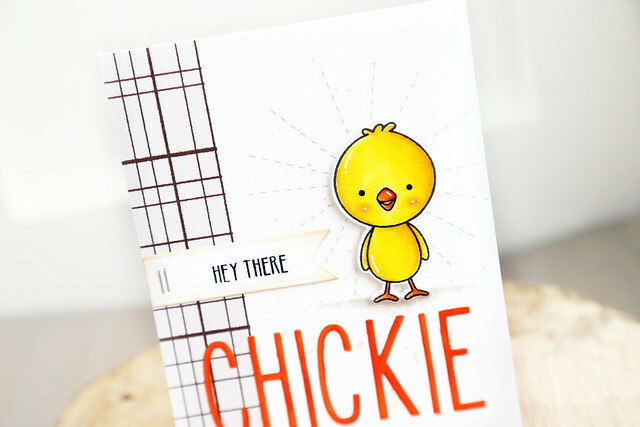 If the chick looks familiar, it's because you can find the digital stamp version in my shop (click!) but if you prefer to stamp, you will be very happy come Friday when you can purchase him in the NT store. 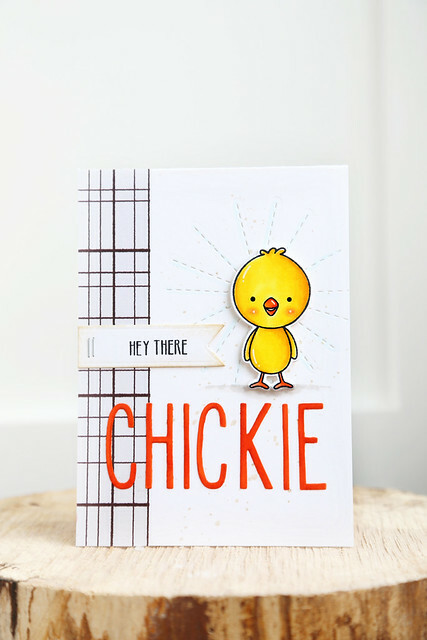 Behind the chick, I use the stitched sunburst die to add some interest and weight to the right side of the card. I really love how that looks! The journaling alphas are still my favorite, and I used them to spell out "chickie." I used the same orange copics to color them as for the beak. I absolutely love her hand-lettering! I gold-embossed the sentiment, and then used a black pen to outline everything. It gives it more pop and lends a more graphic quality to the lettering. The coverplate in the background is something you'll see more of this week, and I cut it in a St-Patty's day green. I brushed some gold ink onto the die-cut in some spots and brought even more gold by way of a few sequins. I hope you like what you see! Check out the NT blog this morning for even more inspiration! 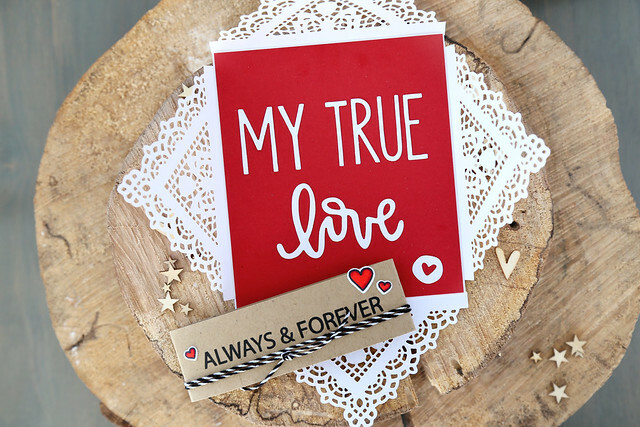 I paired a few stamp sets and cropped a die-cut to get this fun Valentine's day card. The deer, from Into the Woods, was stamped, colored and die-cut in soft browns. I used copic markers E30, E31 and E33 for the deer's body, and then E000 to add a hint of color to the white fur parts. To give a bit of Valentine pink, I die-cut the Hexastar coverplate, but then trimmed it down to a smaller size. 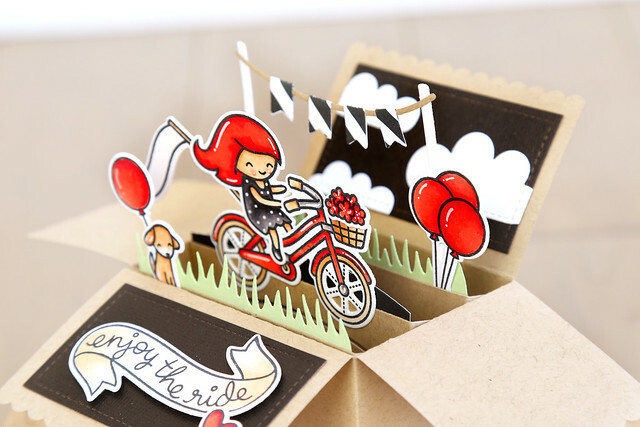 The black and white stripe patterned paper give the card some graphic weight. 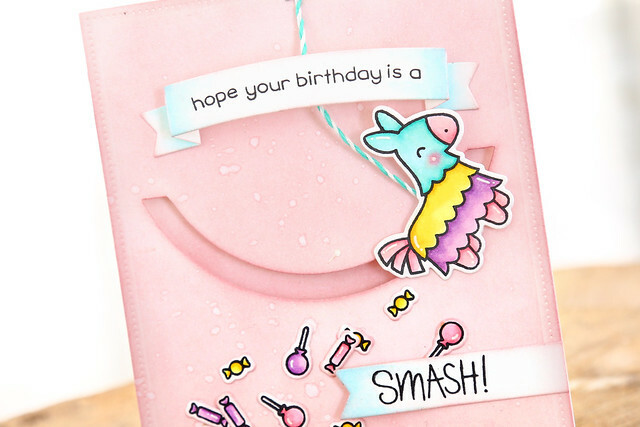 Check out how I grabbed an assorted pack of pink cardstock and just a few dies to create a cupcake decorating party - click! I love a tubby, diapered cupid! He comes with this sentiment, which I sized large enough to be the focal point of the card. 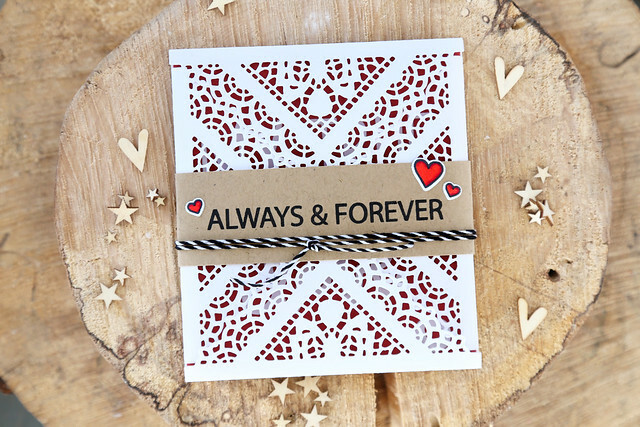 I added some die-cut hearts and floated them around the sentiment. Check out the rest of the digital stamps in my etsy shop: Just ME digital stamps.